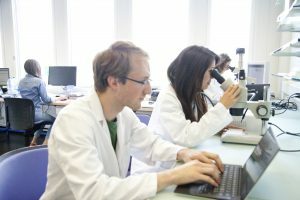 Various stimuli such as viral infection, drugs, alcohol and toxicants can damage hepatocytes, and activate Kupffer cells and hepatic stellate cells (HSCs). This damage can lead to development of liver fibrosis, characterized by the accumulation of extracellular matrix (ECM). Activation of HSCs and their trans-differentiation from quiescent, vitamin-A-storing cells into proliferative, fibrogenic myoﬁbroblasts is well established as a central driver of fibrosis in experimental and human liver injury. 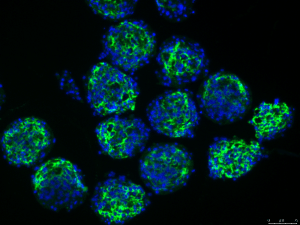 Activated HSCs express smooth muscle actin and ECM proteins such as collagens type I, III, IV, and fibronectin. 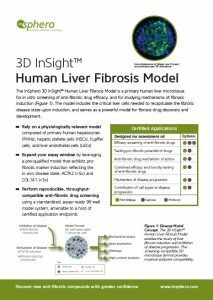 The 3D InSight™ Human Liver Fibrosis Model is based on 3D InSight™ Liver Microtissue technology and engineered to include the primary human hepatocytes, HSCs, Kupffer cells, and liver endothelial cells (LECs) needed to recapitulate the fibrotic disease state upon induction. This model is suitable for efficacy testing of both disease-inhibiting or disease-reverting drugs. 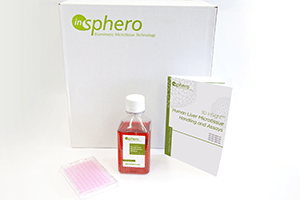 Fibrosis is induced by 7-day exposure to TGF-β in the 3D InSight™ Human Liver Fibrosis Model, which is comprised of primary human hepatocytes, HSCs, Kupffer cells, and LECs. 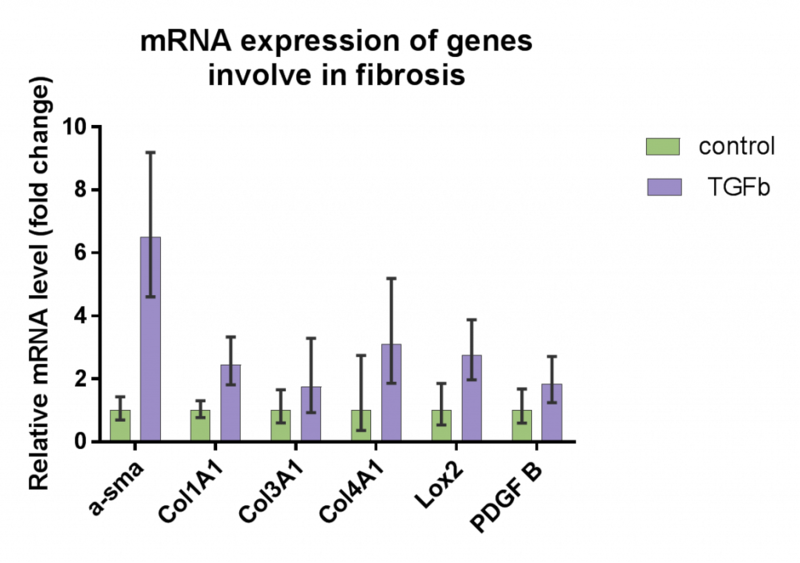 The fibrotic disease state is detected by increased expression of pro-fibrogenic markers. in a physiologically relevant 3D liver disease model.